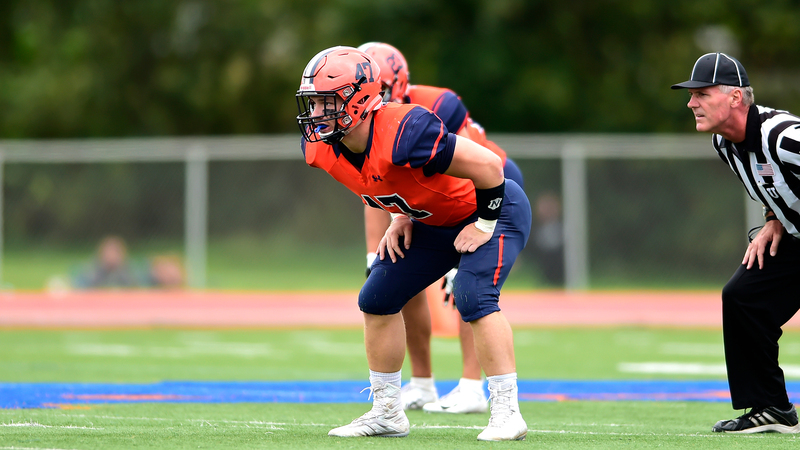 Football Suffers 49-0 Shutout | The Gettysburgian. Muhlenberg College dominated Gettysburg College in a 49-0 rout. Muhlenberg had 463 yards of offense and held Gettysburg to just 128. “Each game that we play we get to learn more and more about where we need to go and what we need to do to be successful and this was just another learning experience. Albeit a hard one,” said Head Coach Kevin Burke. The offense managed just 9 first downs all game, while averaging 2.4 yards per carry and 2.2 yards per throw, and had only one scoring attempt in a missed field goal. First-year quarterback Matt Lajoie completed 6 passes for 40 yards, rushed for 17 yards on 5 attempts and caught 2 passes. Junior running back Andrew Howard added 22 yards on 9 carries. On the other side, senior Jake Skinner totaled 11 tackles to lead the defense and added a tackle for a loss. Senior Matt Graziano and first-year Alex Raimondo recorded the only 2 sacks of the day. Senior Logan Aikey broke his own single-season tackles for a loss record with 18.5. Over his last 19 games, Aikey has 36 tackles for a loss. Junior defensive back Joey LaMore finished with 2 tackles and a key pass break up. “[He] had a phenomenal play where he was initially beat and he stayed with the play and he knocked the ball out. I look at individual plays like that,” said Coach Burke. Gettysburg deferred, so Muhlenberg received to open the game. Muhlenberg marched down the field for an 8-play, 75-yard drive ending in a touchdown to go up 7-0. Gettysburg followed with consecutive 3-and-outs. Both teams punted back and forth until the second quarter when Muhlenberg scored. Muhlenberg took advantage of a short field to push the lead to 14-0. Muhlenberg scored on their next 2 consecutive drives after shutting down Gettysburg, once for a 3-and-out. The half ended 28-0 Muhlenberg. Gettysburg opened the second half with two consecutive 3-and-outs, while Muhlenberg scored on two straight drives to make the score 42-0. Before the third quarter ended, Muhlenberg scored one more time on a pick-six. The next game is against Franklin & Marshall College, a known rival. “It doesn’t get any better than that. They have the Lincoln Trophy, our kids want to get that back, their kids want to retain it. It’s everything college football is about,” said Coach Burke. It’s also the last game of the season. This year’s team has a total of 16 seniors. “This senior class did a lot of things and I have all the respect in the world for these seniors… I just really want them to go out well,” said Coach Burke. Last year, F&M beat Gettysburg 51-21 in Lancaster. This year’s game is at Shirk Field on Saturday, November 10, at 1:00 p.m.